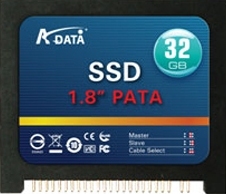 A-Data is launching market demand of solid state drive which is used to replace hard drive. The new SSD series 64GB comes with either 1.8 inch or 2.5 inch with PATA and SATA interface. According to press release, the best configuration setting is 9000 IOPS, input/output operation per second. Another outstanding feature is its ZIF connectors which minimize the problems of bend or damaged pin during inserting and extracting that may take up to thousands of Newton force. No mention of price during the time of shipment. This entry was posted on Monday, December 31st, 2007 at 3:57 pm	and is filed under Interesting Stuff. You can leave a response, or trackback from your own site.